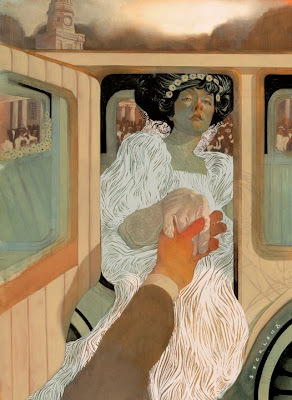 The annual New York Society of Illustrators 2008 Advertising and Institutional exhibition included 42 works of art, all voted by a jury to be the best of their category for the year. Our group was well represented, and two of our artists, Sterling Hundley and Yan Nascimbene, were awarded with medals. In case you missed it, below are pictures of a few of the works of our artists featured at the gallery opening. This week’s featured illustrator is Douglas Smith. Bad news first- my Representative, Richard Solomon lost his office, and years of work in the New York crane collapse two weeks ago. I've posted a commentary on drawger, if you would like to find out more. Fortunately, no one from Richard's group was there. They surely would have been amongst the casualties. Unfortunately, I, along with everyone else, lost original art to the random event. My first Gold medal winner from the Society of Illustrators- Edgar Cacey, the Sleeping Prophet, and the angel/divers illustration were lost. New work completed for Virginia Living- the Gibson Girl. 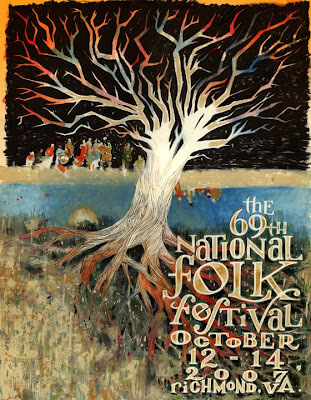 An older piece for the National Folk Festival to share. My wife and I will be traveling back to New York to attend the Society of Illustrators Advertising/Uncomissioned show. I will be picking up my second gold medal from this year's annual! 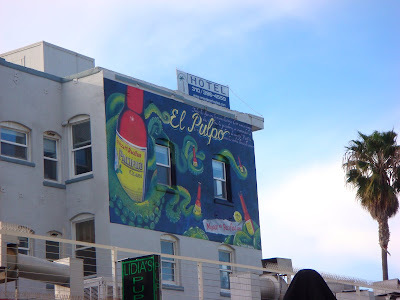 The advertising project that I created for Pacifico Beer's El Pulpo, which was comissioned by Creature Seattle is up in Venice Beach. It will also be painted on a VW van in California, as an extension of the "street" campaign. My visit to CCA and San Francisco was amazing! My wife was able to attend, and we were treated very well. Thank you to Barron Storey, Owen Smith, and Alexis Mahrus for facilitating the visit. I sat in on Owen's critique, gave a short demonstration, and held a lecture. This week’s featured illustrator is Liz Lomax. I just want you all to understand how utterly grateful I am that fate dealt its deathly blow on a Saturday. I know each of you has emotionally dealt with, and are most likely still dealing with, the enormity of the catastrophe of March 15. Ironically, I was standing in line at my local Post Office sending a Priority Envelope to Scott with some scans of new artwork, at, most likely, the very minute the address it was being sent to, ceased to exist. The tragedy for all the families and friends of the dead, cannot be minimalized, and there is no joy in the understanding of the great loss of time, energy , and history, in the offices of Richard Solomon Artists Representative. But after living through a very long Saturday afternoon, waiting to hear from Greg that all of you had been accounted for (Scott called Greg, so he was clear... Krista confirmed OK, Bryan next , a VERY long hour before Richard , and an excruciating many hours before Meredith in the clear) and gaining a more complete comprehension of the focused devastation, I must admit to having a sense of joy. Joy that can only come from realizing , how, placed so directly in the path of fate, you all are safe, and full of the exact same vigor and energy that you have always had. I look at the pictures, I see "Krista's window" standing as a lone reminder of what was... I see the black and yellow trimmed Mini in the street that Wendy and Julie laughed at me for stopping and looking at, parked at the curb opposite 305 on that wonderful Sunday morning as we walked to the Beekman for brunch. On Saturday afternoon, I watched live, on CNN and FOX, as the NYFD walked over familiar places where desks were, and where, for all I knew, the darkest possibilities lay. We all suffer personal tragedies in our lives, as that is as much a part of life as are the great pleasures of it all. But this event brought greater and very special meaning to common words like friend, colleague, business associate, and representative. You are all so much more, and the joyful ache in the center of my chest is exact proof of that to me. Thank you, for all you are, and continue to be, in our lives. Previous articles called the accident a scene of total destruction. “On Sunday, city officials released a detailed description of the collapse at 303 East 51st Street, saying that workers were “jumping” the crane — intricately adding sections to raise the crane — when a steel collar used to secure the crane to the building fell. That piece sheared off a lower collar, and the entire structure toppled,” the Times reported. Read the full article here. On Saturday, March 15th, 305 East 50th St. was hit by a crane, resulting in one of the worst construction accidents in NYC’s recent history. The offices of Art On A Grand Scale and Richard Solomon, Artists Representative were on the first floor of the decimated building. Richard speaks briefly about the loss of his space, along with the priceless works of art inside. Last Saturday, March 15, Richard Solomon's office was demolished in a construction accident on Manhattan's Upper East Side. We are all very fortunate that this event occurred on a Saturday, and Richard and all of his employees are fine. As we move forward and start to rebuild the business, we will no doubt call on the help and moral support of our artists, clients, and friends. We will post updates on our progress and we truly appreciate all the support we've received so far. We're all alive and unscathed and that's what's really important. Everything else that can will be rebuilt in time. You might see them at the Met. Only, he's got a pulse. This week’s featured illustrator is Gregory Manchess. This week’s featured illustrator is Rudy Gutierrez. "National Geographic: The Art of Exploration" featuring Gregory Manchess, along with artists James Gurney, Richard Schlecht, and Art Director Chris Klein. Part 2 (bottom) & 4 (top).